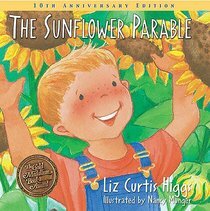 The Sunflower Parable shares the story of Logan, a young gardener who hopes to grow sunflowers that reach all the way to heaven by summer's end. Side by side with his father, the wise farmer, Logan discovers the value of planting seeds, not only in the ground, but also in the hearts of his friends and neighbors. Customer Reviews For "The Sunflower Parable"
I read this book to my Preschool class, thinking it would be about 'planting seeds in the hearts of others.' The story mostly focuses on the literal aspect of planting sunflower seeds with the farmer, but does include Bible verses which create an opportunity to discuss how we can sow into the lives of others. It was not exactly what I had been expecting, but still a wonderful story and the 4 year olds enjoyed it.